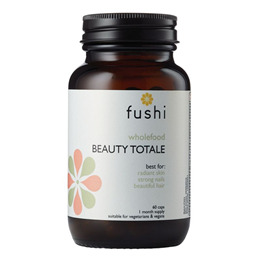 The Beauty Totale is a unique complex specially formulated with 24 very essential nutrients for radiant skin, beautiful hair and strong nails, and is one of Fushi`s most popular products. Ingredients such as alpha-lipoic acid, biotin and silica are renowned for their effects on the skin and hair and ensure glowing results within weeks. Vitamins C, E, A, and B complex are all known to help improve skin health. The B vitamins help reduce stress too, which is a contributing factor that causes skin to look dull. Vitamin A and beta carotene help repair and regenerate the skin. Zinc is known for its benefits for spots and pimples. Silica contributes to collagen formation. Vitamin C is important in the production of collagen and essential amino acids support elastin and collagen production. Beta-carotene and vitamin E help the skin`s natural defence against the sun. The new formula has added co enzyme Q10 to assist with the rejuvenation of collagen and elastin and resveratrol for its potent protective anti ageing nutrients and its ability to help reduce oxidative stress. Pine bark extract in the formula helps to protect against free radicals and oxidation, while spirulina provides essential fatty acids to nourish the skin. All these ingredients have been formulated in Beauty Totale, and are in bio available form which means the nutrients are in the most absorbable form. Vitamin C (ascorbic acid), spirulina powder, hydroxypropylmethyl cellulose (capsule shell), zinc citrate, l-lysine hydrochloride, bio-pine (blend of pine bark extract, apple pectin &: beta carotene [natural]), vitamin E (D-alpha tocopheryl succinate), magnesium stearate, nicotinamide, l-tyrosine, ferrous fumarate, calcium pantothenate, alpha lipoic acid, citrus bioflavonoids, coenzyme Q10, grapeseed extract, horsetail extract, methyl sulphonylmethane, resveratrol, selenomethionine preparation, vitamin B6 (pyridoxine hydrochloride), copper gluconate, vitamin A (retinyl acetate), silicon dioxide, vitamin D2 (ergocalciferol), chromium picolinate, folic acid, biotin, vitamin B12 (cyanocobalamin). 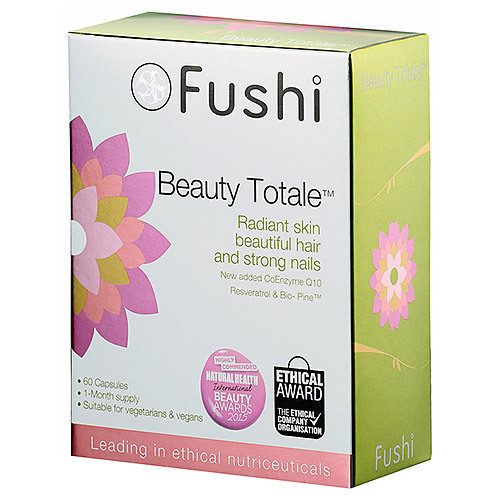 Below are reviews of Fushi Beauty Totale - Skin, Hair & Nails - 60 Capsules by bodykind customers. If you have tried this product we'd love to hear what you think so please leave a review. Great product for beauty but also very calming!